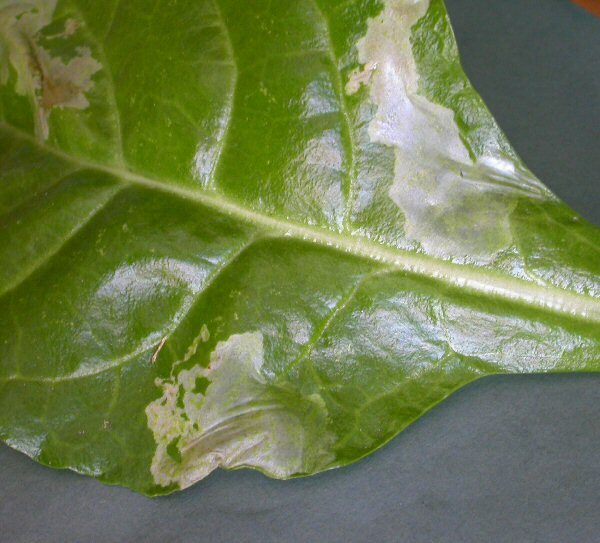 Notes: Makes a large upper surface whitish blotch (as shown), which can contain several larvae. The frass has a washed out appearance and is greenish. There may be several mines on a leaf and eventually the leaf will be mined and then shrivel up. To identify this miner adults must be reared. Michael Ackland identified the adults which were reared from these illustrated mines. Mine shown on Beet. Michelsen revised the Pegomya species in the hyoscyami complex (1980) and reduced he large number of species, described from colour forms and/or rearings from different plants, to 4 species, all based on structural characters. So any records of host plants prior to this revision must be suspect. So up to 1980 the only reliable plant hosts were those from the material he examined.